Bottom left: photo by Cody Gold. Top left: photo by Sara Wickham. Top right: photo by Bridget Woods. 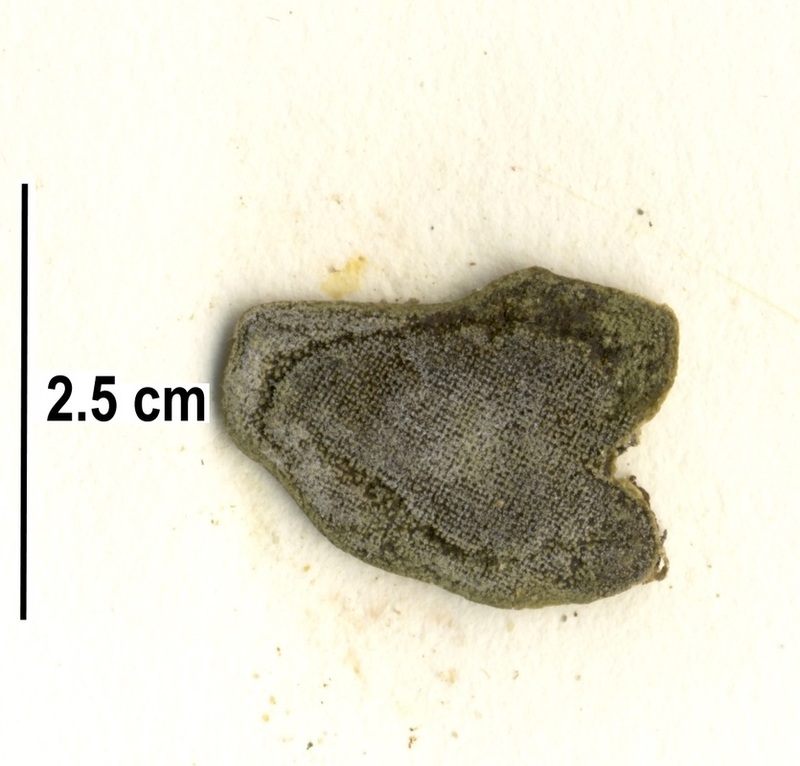 Bottom right: specimen from a Calvert Island beach; specimen collection number SCL 15323 in the UBC Herbarium Algae Database. Photo by Sandra Lindstrom. Search the collection numbers in the database for further details on this specimen, or search this species for additional occurrences. 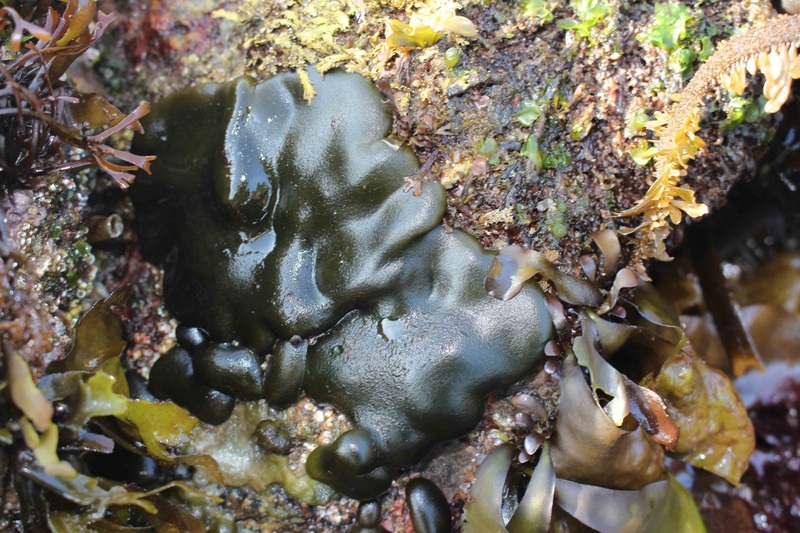 This perennial green alga does not look like a typical seaweed: its smooth and irregularly-shaped cushions appear more similar to sponges or bryozoans. The dark green cushions, which get to 25 cm in diameter and 15 mm thick, are actually composed of numerous filaments that are too narrow to be visible to the naked eye. More photos are available on the AlgaeBase species page. 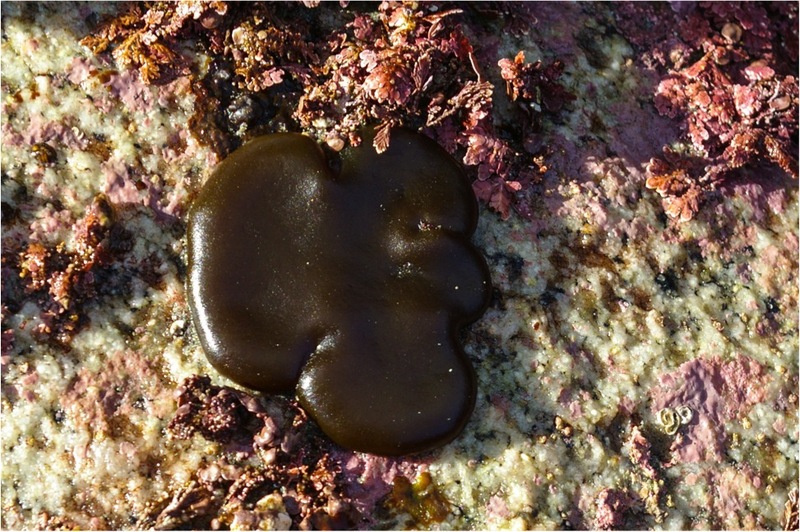 Smooth spongy cushion grows on rocks in the low intertidal and shallow subtidal. It is found on semi-exposed and exposed coastlines in the Pacific Northwest. Some sources report that its range extends south to Mexico, while Lindberg and Lindstrom put Oregon as the southern limit. Likewise northern Alaska is often recorded as the northern limit, though Lindberg and Lindstrom report it as far north as the Arctic Ocean and Bering Sea, as well as along the coasts of Japan and Russia. 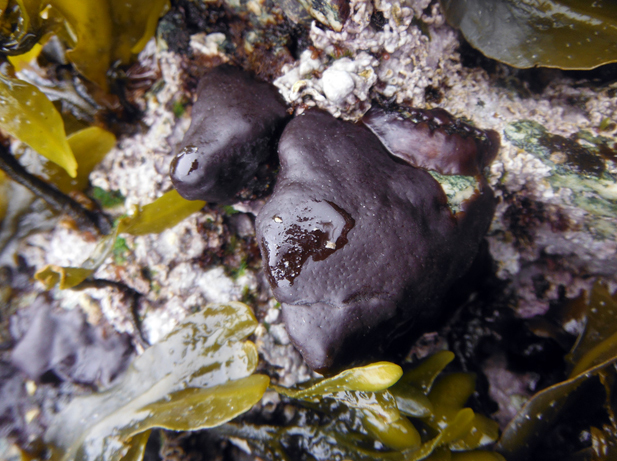 Coarse spongy cushion (Codium ritteri) is found from northern British Columbia to Alaska, the Bering Sea and Aleutian Islands, and Russia. As its name suggests, it is not as smooth as smooth spongy cushion - it is composed of filaments with swollen tips, which are visible as tiny dots. This species is often eaten by some nudibranch species. Harbo, R. M. (1999). Whelks to whales: Coastal marine life of the Pacific Northwest. Madeira Park, BC: Harbour Publishing. P. 282. Lindberg, M. and Lindstrom, S. (2010). Codium setchellii. Seaweeds of Alaska. Accessed 13/11/2014. Guiry, M.D. & Guiry, G.M. (2014). Codium setchellii N.L.Gardner. AlgaeBase. National University of Ireland, Galway. Accessed 13/11/2014. O'Clair, R. and Lindstrom, S. Codium setchellii Gardner. In Klinkenberg, Brian. (Ed.). E-Flora BC: Electronic Atlas of the Plants of British Columbia. Lab for Advanced Spatial Analysis, Department of Geography, University of British Columbia, Vancouver. Accessed 13/11/2014.